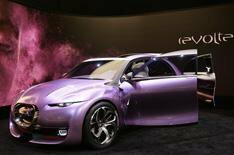 Frankfurt 2009: Citroen Revolte | What Car? Last week Citroen released a teaser photo of a new concept car - however, with a little Photoshop trickery, we could see the whole car, rather than a sneaky outline. Well, now we've seen it in the metal we can report the Revolte or REVOLTe as Citroen's marketing department would prefer is a hybrid supermini inspired by Citroen's iconic car, the 2CV. Not quite. Whereas the 2CV was pretty much as basic in motoring terms as you could get, the Revolte is luxurious, colourful and technologically advanced. Revolte has a re-chargeable hybrid powertrain that combines a small-capacity conventional combustion engine with an electric motor and a battery re-charging function. It can also be driven on battery-only mode. The folding roof is another source of power as it is covered in solar panels. They generate electricity to help power things such as the air-conditioning. The car is a three-seater, with the driver's seat set to one side and two passenger seats behind it. Citroen says the rear seats are designed to resemble a sofa. The passenger on the opposite side to the driver can stretch out their legs fully into the space where the front passenger seat would normally be. Alternatively, it's possible to fit a rear-facing child-seat in the space available.